„After one of the first events of the campaign, Andy and I got talking in the hallway, and I talked about how a campaign of civility and respect would be good,” said Norman, who lives in Griswold. „I said, ‘Andy, you might have better name recognition than me and if the press catches on, it could help me more than you,’ ” he said, noting that the unlikely partnership could boost his lesser-known campaign. Nu numai că au ales o campanie fără atacuri, dar cei doi chiar îşi fac parte din campanie împreună organizând dezbateri cu public. Throughout the evening, the two men were exceedingly polite to one another, displaying conduct rarely associated with politics and government. 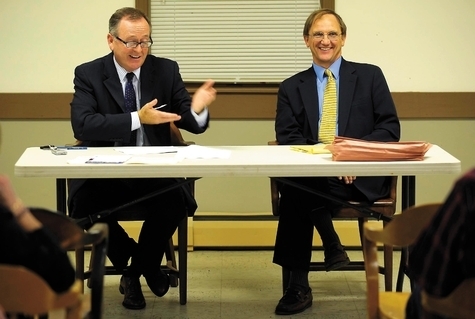 It’s an ongoing, open dialogue like theirs, both men said, that will be necessary for state officials working to solve Connecticut’s budget problems. Rar exemplu de civilitate, avand in vedere polarizarea politica din SUA.